Every wedding should be distinctive and unique, just like each couple. At The Lake House at Ferry Point Inn, we offer a very special wedding venue on the shores of Lake Winnisquam. The tranquil, romantic setting has lovely grounds with lake-front views surrounded by forests and distant mountains. Imagine taking your vows with a golden sunset reflecting on the sparkling water. Then join your guests for a perfectly planned reception on the picturesque lawn of our charming New England inn. 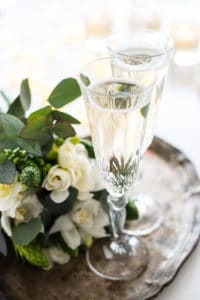 We’re the ideal wedding destination for smaller parties and elopements. Our staff is dedicated to making your day relaxed and enjoyable for you and your guests. Contact us today for more information about our wedding services. 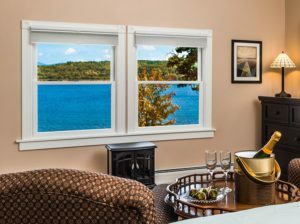 Our private, quiet location is also one of the few lakefront bed and breakfasts in New Hampshire. Making this a unique place for an intimate celebration of up to 50 guests. Our gardens bloom in the Spring, the Summer sunshine sparkles on the lake, and the Fall foliage explodes with color before the Winter snows dust the mountain tops. In any season the landscape makes for a gorgeous backdrop for photographs. Our classic bed and breakfast offers a warm and welcoming atmosphere. We can accommodate up to 27 guests a night in our 10 elegant rooms many with peaceful water views. While the wedding couple enjoys the privacy of our Lake Solitude Suite. This two story cottage has its own separate entrance, a full kitchen, and breathtaking views of Lake Winnisquam. Upstairs unwind in a Jacuzzi tub, then sleep peacefully in your California king bed. And, of course, each morning begins with a gourmet breakfast for all our guests. In addition to your perfect wedding location, our inn and the Lakes Region make for a wonderful getaway. After all it’s a popular vacation spot with great dining and recreational activities. Gather with your guests on the inn’s generous front porch or sunny lawn. Explore our small beach, or take one of the guest kayaks for a paddle. Our seasonal guide highlights all the many attractions the Lakes Region offers visitors. Then there are all the wonderful local restaurants to sample. Whether you’re looking for a quiet romantic night out or treating your friends to live music at a pub, there are plenty of great options. At The Lake House at Ferry Point Inn we help plan and design your personal vision for your very special day. Our lovely property and water-front gazebo create the ideal setting for your wedding. We can also connect you with local churches or Justices of the Peace to perform the on-site ceremony. Additionally, we have a comprehensive list of local services and resources. We’ll provide information for event planners, caterers, vendors and everything you need for a wonderful wedding. Our goal is to make the planning as easy as possible and create a celebration that exceeds your dreams. We love hosting the most important day of a couple’s life and helping them begin their journey together. If you are searching for that special wedding venue, come visit our romantic hideaway. Book a couple’s getaway with us today and discover your perfect wedding location.